On 3 November, on the website of the French Internet portal Actu-Transport-Logistique, which covers the topics of transport and logistics, there was published an article on Skyway transport with the title "Innovative Transport System: SkyWay Is Gaining Ground in the UAE". The article discusses the project of Skyway Innovation Centre construction in the United Arab Emirates: its current state, advantages and development opportunities. SkyWay Technologies Co. signed a contract in the United Arab Emirates for the construction of the first 25-hectar test area. According to estimates, in the future, the SkyWay transport system will be able to transport up to 250 million tons of cargo per year. SkyWay Technologies Co., located in Minsk, was one of the triumphs at the recenttransport exhibition InnoTrans in Berlin. The company develops an innovative transport system that can meet the requirements of freight and passenger transport. In cargo mode, the SkyWay transport modules, which are controlled by a computer, can move at a speed of up to 150 km/h. The SkyWay transport is much safer than existing analogues due to the location of tracks above the ground: this eliminates the crossing of transport lines and reduces the accident rate. The concept is exported to the United Arab Emirates. The described opportunities, as well as low costs for the construction of transport lines, aroused interest in the United Arab Emirates. The agreement signed on 14 October, 2018, with the Research Centre of Sharjah Research Technology and Innovation Park aims at the construction of the first test site stage on the area of 25 hectares. The construction is planned to be completed in 2019. Yunitskiy also added that the development of SkyWay in the United Arab Emirates will allow to realize the potential of the string technologies more fully than in Belarus, where we had difficulties with obtaining a suitable site." 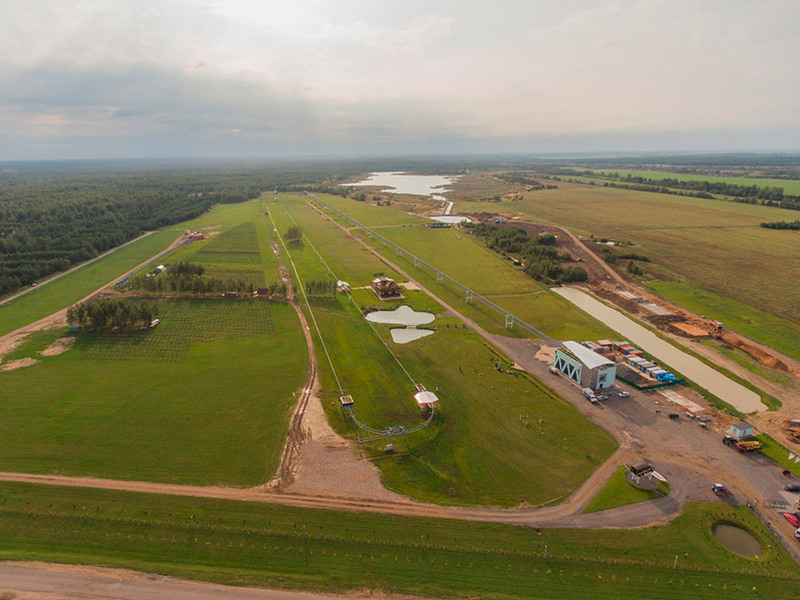 In Belarus, SkyWay Technologies Co. it has only a short test site, built in 4 years at the EcoTechnoPark. Therefore, now the company cannot demonstrate the ability of the modules to move at a speed of up to 150 km/h or operate in climatic conditions that are not mild. The track was built for light vehicles, the mass of which varies from 6 to 8 tons. The high-speed track is also planned outside the innovation centre in Sharjah. The length of the line will be 25 km and located in another Emirate of the UAE. This length will be enough to allow the high-speed unibus to accelerate up to 500 km/h. Thus, the company will be able to demonstrate the ability of its transport to operate in the harsh weather conditions of the Middle East. However, as with other innovative transport systems, SkyWay Technologies Co. must first convince investors to finance the project, showing all the potential benefits and risks.